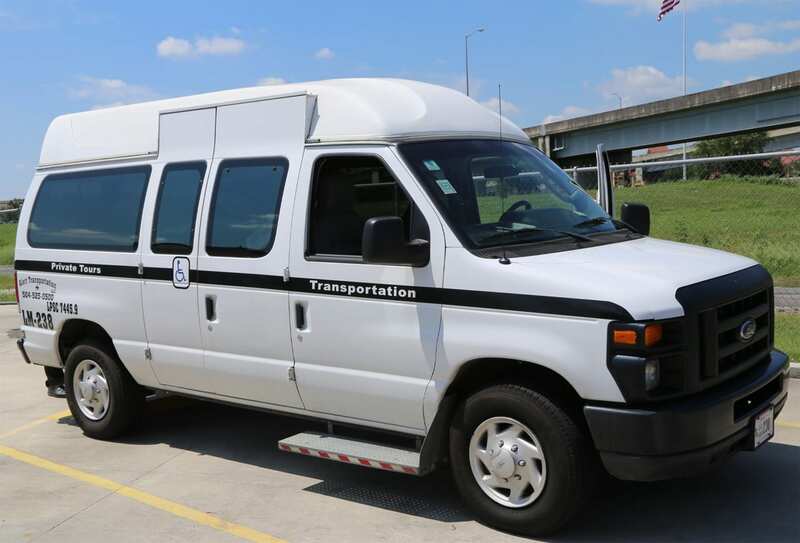 Alert Transportation offers chauffeured transportation service for the mobility impaired with our ADA Handicapped Accessible Lift Van that can transport 3 passengers. Alert Transportation provides quality wheelchair transportation services for individuals. Our vehicles can providing transportation for three individuals plus one wheelchair. Our Mobility Impaired Transportation can help individuals get to and from doctors’ offices to a night out on the town. Alert Transportation wheelchair vans are equipped with crash certified and approved Ferno oxygen brackets, ensuring our patient’s safety while the transport vehicle is in motion. Our phones are answered 24 hours a day / 7 days a week. Call 504-362-4145 – day or night for pricing of your chauffeured Transportation Service. The Wheelchair Lift Van will sit 3 people plus a person in a wheel chair. Let Alert Transportation Provide You With The Best Car & New Orleans Limousine Services. When you call Alert Transportation, you get a real person, not a reservation website . We are a locally owned, family-run company that provides in offering the best customer service. Since 1999, we have provided the best private transportation services with a wide-variety of beautifully maintained vehicles to choose from. We have two Antique Rolls Royce motor vehicles, black and white Limousines, Limo Buses, and even Party Buses. Call Alert Transportation and reserve your private, chauffeured vehicle today. ALERT TRANSPORTATION BETTER THAN EXPECTED! Thank you Alert Transportation for excellent service on my wedding day. All drivers were on time and very friendly. The vehicles were clean and well kept. Mr. Milton, was even kind enough to wait a few minutes for my husband and I to finish saying our thank you’s and goodbyes to family after reception. Alert Transportation exceeded mu expectations. I will be recommending Alert to my friends and family. My limo service exceeded my expectations. The family love the convenience and our driver “Charlie” was very friendly and attentive during the charter. Since there was lots of construction and traffic, we were able to ride comfortably in a nice and clean transport for everyone. I would definitely refer Alert Transportation and use this service again for a wedding or other group event. Atlanta, Ga.
We’re very pleased with the vehicles and service you provided for our wedding on November 16th, 2012. The limo looked clean inside and out. I liked the lighting and the décor. It looked new and luxurious instead of old an worn out. You were on time, your driver was courteous and you didn’t run out of gas (unlike other horror stories that I have heard about with other companies. I am glad that Alert added to our evening instead of providing a negative memory! Riverridge, La. As we return to normal like after our son’s wedding in New Orleans, i wanted to thank Andrea, the 2 drivers, Herman and Stephen , for Alert on your outstanding service. The buses were right on time, clean, and cool. the drivers were so friendly went off without a hitch. I wanted to follow up to commend the service the National Parks Conservation Association group received from our four assigned drivers over the last weekend – the two gentlemen on Friday February 10 and the two ladies on Saturday February 11. In all cases, the drivers were professional, approachable and safe. We were very pleased with everything. The ladies especially got a warm round of applause from our group on Saturday when they were able to get us right up to the hotel, beating the road closures for Krewe de Vieux, which was great because we had a couple of limited walkers in our group. Please thank our drivers again and thank you overall for your good service. I’m glad we went with Alert. I wanted to tell you thank you for working with our Krewe this year. The party bus was FANTASTIC and so was the driver! We had a wonderful experience and I will be talking with the other members who use party buses to use your company next year. I already have a task on my calendar to book early. Now that I’m home from my trip, I wanted to take the time to tell you that our Oak Plantation/Swamp Tour was wonderful. From the moment we were picked up, our driver Brian Webber entertained us with both facts and antics about the areas we went through. He was both knowledgeable and very funny. Brian’s responsibility should have ended once he left us at the Swamp Tour, but it didn’t. Realizing that my son had left his All Star cap on the bus, Brian left several messages for me at our hotel and went out of his way to deliver the cap to us the next day, which was his day off. I hope you realize how much of an asset having a person of Brian’s character is to your company. He even refused to take a tip that I left him for going out of his way to drop the cap off. I just wanted to tell you, it was a pleasure using your services. Every pick up was very much on time and even early in some circumstances. The drivers were very polite and knowledgeable. We were especially happy with Chris, the driver who picked my 13 family members up at the seaport, gave us a tour of New Orleans and took us to the airport. My family is still raving about him. What a gem. He took is to the garden district and city park, not to mention the short cemetery tour. As you know, our trip to New Orleans got delayed by 2 days due to weather in New Jersey. Because he was so knowledgeable we felt we actually got to see things we would never have seen. He made everything ok and we feel we had a nice taste of the area. Please thank him again from our family. He truly was the icing on the cake for our wonderful trip. He picked us up at the Norwegian cruise line. Your buses arrived right on time and we managed to get everyone onboard in a timely manner. Your drivers were courteous and very professional. I would definitely use your services again. I would like to thank Andrea Roser and all of the drivers who transported my family and guests this past weekend. We were in New Orleans for my daughter’s wedding, and had to change our plans because of the threat of Hurricane Nate. We had several changes in the pick up times for transport, and Andrea was always kind, cheerful, helpful and efficient. All of the drivers were not only on time, but were courteous and professional. Best regards to all of you!